We attended the 7th NDA Estate Supply Chain Event held in Manchester on 2 November, where we had the opportunity to showcase our expertise in providing asbestos management services to the nuclear sector. 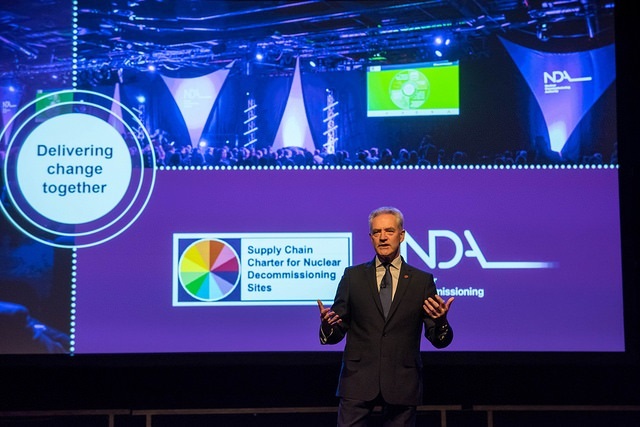 Hosted by the Nuclear Decomissioning Authority, the event is the biggest networking event for nuclear decommissioning in Europe. As well as providing an excellent opportunity to meet with potential new clients, the Franks Portlock team attended a number of presentations to find out more about nuclear industry procurement opportunities and the challenges and innovations happening across the sector. Lawrence Clack, commercial manager at Franks Portlock said: “Attending the exhibition was great for our business development activity – we were able to network with potential new clients and find out more about the procurement opportunities that are available. In August 2014, Franks Portlock was awarded the contract to provide asbestos analytical services to Sellafield Ltd in a four- year contract worth £2 million. The contract means we provide site-wide support to Sellafield, its partners and suppliers for maintenance, site remediation and decommissioning.